Glycine (Gly) is one of the amino acids, commonly found in proteins, coded by codons GGU, GGC, GGA and GGG. Glycine is the unique non-optically active amino acid. The Gly-ferricyanide reaction catalyzed by Pd(II), under pseudo-first-order conditions, has been spectrophotometrically monitored at the ferricyanide λmax of 303 nm at constant temperature. The experimental rate law for the reaction is: rate = kı [Fe(CN)6 3-] [Gly]x [H+]y [Pd(II)]z, where x, y and z are fractional orders. Additionally, the effect on the rate of adding the reduction product, [Fe(CN)6 4-], has been found to be negligible. Variations of the ionic strength and the dielectric constant of the reaction medium have an effect on the rate. Activation parameters have been evaluated using Arrhenius and Eyring plots. A suitable mechanism has been presented and the derived rate law is consistent with the kinetic data. Keywords: Acid medium, activation parameters, ferricyanide, glycine, mechanism, oxidation kinetics, palladium(II) catalysis, rate law. Keywords:Acid medium, activation parameters, ferricyanide, glycine, mechanism, oxidation kinetics, palladium(II) catalysis, rate law. Abstract:Glycine (Gly) is one of the amino acids, commonly found in proteins, coded by codons GGU, GGC, GGA and GGG. Glycine is the unique non-optically active amino acid. 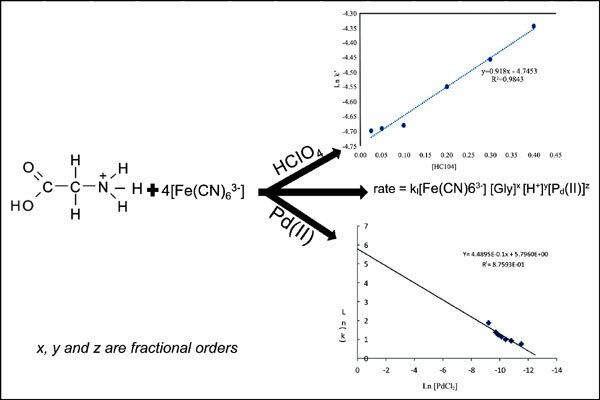 The Gly-ferricyanide reaction catalyzed by Pd(II), under pseudo-first-order conditions, has been spectrophotometrically monitored at the ferricyanide λmax of 303 nm at constant temperature. The experimental rate law for the reaction is: rate = kı [Fe(CN)6 3-] [Gly]x [H+]y [Pd(II)]z, where x, y and z are fractional orders. Additionally, the effect on the rate of adding the reduction product, [Fe(CN)6 4-], has been found to be negligible. Variations of the ionic strength and the dielectric constant of the reaction medium have an effect on the rate. Activation parameters have been evaluated using Arrhenius and Eyring plots. A suitable mechanism has been presented and the derived rate law is consistent with the kinetic data.